Alternative Learning EXperiences (ALEX) provides education support and substance abuse intervention, in partnership with local schools, for students who need help. Working with young men and women, and their families, our innovative team assists individuals in overcoming addiction to drugs and/or alcohol while earning credits toward their high school diploma or GED. I love my ALEX Center. I don't feel bullied or put down here. People treat me like I am important. 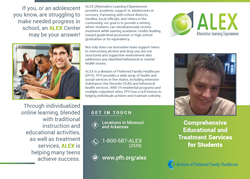 ALEX Centers provide comprehensive educational and treatment services for students grades 8-12. Potential students receive a thorough assessment to determine individualized needs. 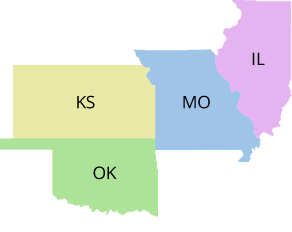 Once enrolled, information gathered is used to ascertain how to tailor the student's service plan for both treatment (support sobriety) and educational needs (to earn credits toward grade-level promotion or high school diploma). What educational services are provided? Virtual (online) curricula include core courses, remedial, and accelerated educational options for credit recovery and/or standard high school courses. Credits earned at the ALEX Center transfer back to the student's home school district, which issues the course credit or diploma for the student. Because of ALEX, I became a better person for myself, and I now have a future to look forward to. Because of ALEX, I now have hope. What treatment services are provided? On-site individual and group counseling provided. Each student receives a random/regular urine analysis. I am able to concentrate on my studies without worrying about being pressured to smoke pot or go to a drinking party. These are distinguished by a recovery focus on personal, family, and community. With long-term recovery; respect for diverse pathways and styles; and emphasis of recovery support over time. I went back to my high school, but my grades were starting to drop. I felt alone and isolated and felt like my world was falling apart. I called my ALEX teacher and said I just want to come home (to ALEX). 8333 East Blue Pkwy Dr.